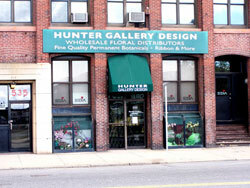 The showroom of Hunter Gallery Design is displayed as a unique concept featuring all of the products merchandised as they would be in a retail environment. It also features an abundance of tropicals, greenery, seasonal and holiday items. As an Honorary Board Member of The New England Unit of Teleflora and having over 20 years in the floral industry, which ranges from retail to design to wholesale, we cater to the discriminating floral professional. Wholesale Floral Distributor specializing in the finest quality permanent botanicals, greenery, ribbon and floral accessories in the industry. Visit Pottery by Hunter offering a full range of fine quality pottery, colored glass and metal containers.